This was the 7th broadcast of Myoujin WiFi Radio. The guest was Nishida Nozomi, the first guest of this show. This was the first time that Sawako and Haruka met Nozomi. Nozomi has a lot of experience going to foreign countries. She had lived in Spain for 3 months when she was in grade school. During high school, she went to school in Denmark for one year. Nozomi said she wanted to go to Germany, but there were too many people who wanted to go there so she had to choose Denmark. When Nozomi was in college, she went on vacation to Italy. Haruka said she went to Italy when she was in college too. 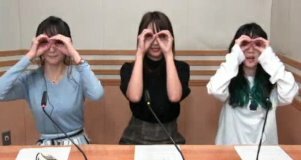 Nozomi joined Sawako and Haruka in doing the skit commercial. They all read mails together and talked. Nozomi will also be a guest next week. In the foreign otaku event corner, Chiaki said that her birthday was 11/11. Then she introduced an anime and cosplay event in Russia.